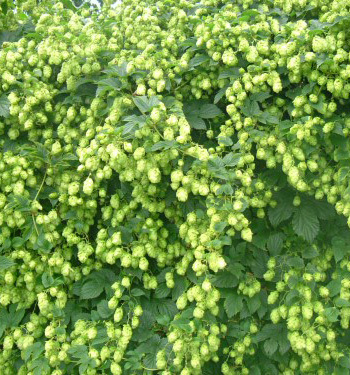 The hop vine is a perennial fast-growing, twining, climbing plant. Many angular, rough, prickly, stems grow up to 20 feet long from a branched rootstock. The leaves are rough, opposite, cordate, serrate, and 3 to 5 lobed. The flowers are yellowish-green, the male arranged in hanging panicles, the female yellow flowers in catkins. 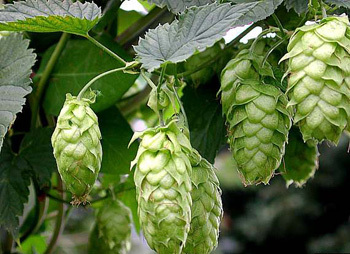 The name hops usually refers to the scaly, cone-like fruit that develops from the female flowers; they enlarge to become pale yellow-green “hops” with papery bracts. Wild in many places in the world but mostly cultivated in the United States. Found wild in woods from Nova Scotia to Manitoba and Montana, south to North Carolina and Arizona. Commercially grown in California. Wild common hop is native to China, Japan, and many other islands. The word hops is taken from the Anglo-Saxon hoppen meaning “to climb” because the twining perennial plant attached itself to neighboring objects and grows to a great height. The botanical name Humulus is derived from humus or moist earth, the type of soil the plant thrives in best. The active principle is lupulin, a glandular powder. The volatile oil is responsible for the peculiar fragrant odor. The resemblance of its conelike catkins to a grapevine may have first drawn attention to the hop as a plant suitable for making beverages. The ancients used hops in beer; records of the Jews’ captivity in Babylon refer to a strong drink make from hops that was said to prevent leprosy. To the ancient Romans the hop was a garden plant: Pliny says the young shoots of hops were eaten as a salad in the spring. Apparently, the hop grew wild among willows and, with its aggressive weedlike growth, had an effect on the willows comparable to a wolf among sheep, so the Romans called it lupus salictarius. Linnaeus used this tradition when he gave the plant its scientific name, Humulus lupulus. Originally, used in ale as a preservative. Hops give beer its pleasantly bitter taste, improve its ability to keep well, and give it certain sedative qualities. Pillows stuffed with hops are traditional cure for insomnia: King George III and Abraham Lincoln used such pillows in the search for much-needed rest. Hops has a calming effect on the nervous system. Hop tea is recommended for nervous diarrhea, neuralgia, and restlessness. Helps stimulate appetite, dispel flatulence, boils, headache, toothache, earaches, pain, nervous tension and stress, jaundice, kills worms, mucus colitis, gonorrhea, ulcers, poor circulation, blood purifier, inflamed rheumatic joints, muscles cramps, neuritis, neuralgia, shock, and relieve intestinal cramps. Combined with valerian (for antispasmodic properties) for coughs. A cold tea, taken 1 hour before meals, is particularly good for digestion. Hops also have diuretic properties and can be taken for various problems with water retention and excess uric acid. Externally, a poultice can be used for inflammations, boils, ringworms, tetters, tumors, painful swellings, and old ulcers.